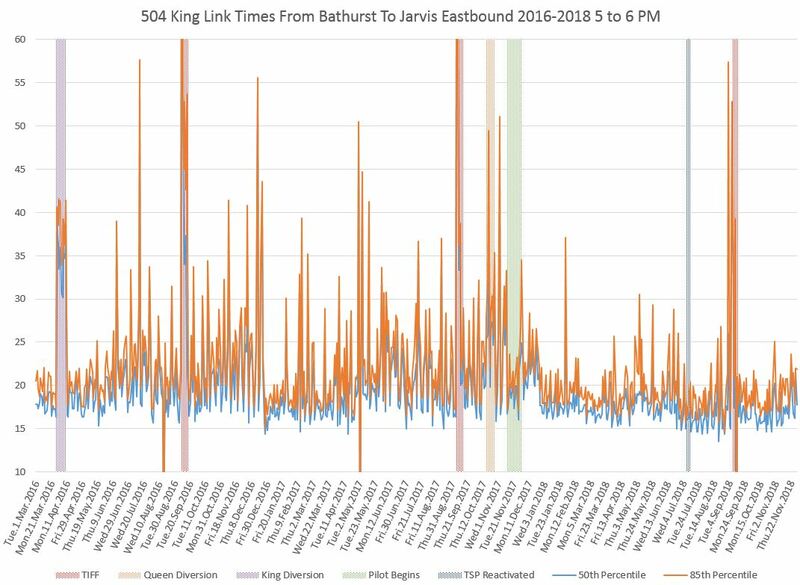 November 2018 was the first full month of the consolidated 504/514 King/Cherry services with subroutes from Dundas West to Distillery (504A) and Broadview to Dufferin (504B). The new service design does not affect running times through the pilot area, but is does have an effect on headways depending which portion of the route one is travelling. 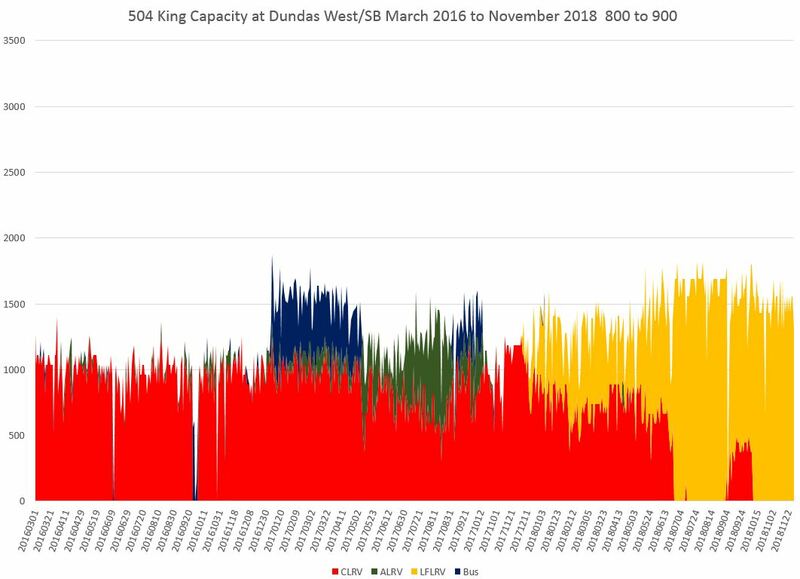 The transition to 100% low floor operation on 504 King is now complete and there was no change in the scheduled service capacity after the mid-October route consolidation. 503 Kingston Road trippers continued to operate with the smaller high-floor cars to the Charlotte Loop at Spadina through November. In January 2019, the 503 will revert to bus operation and will loop over the standard streetcar routing via Church-Wellington-York. This will slightly reduce the capacity for short trips within the pilot area during peak hours. This article deals with travel times and line capacity. In Part II, I will turn to headways (the time between vehicles) and reliability. 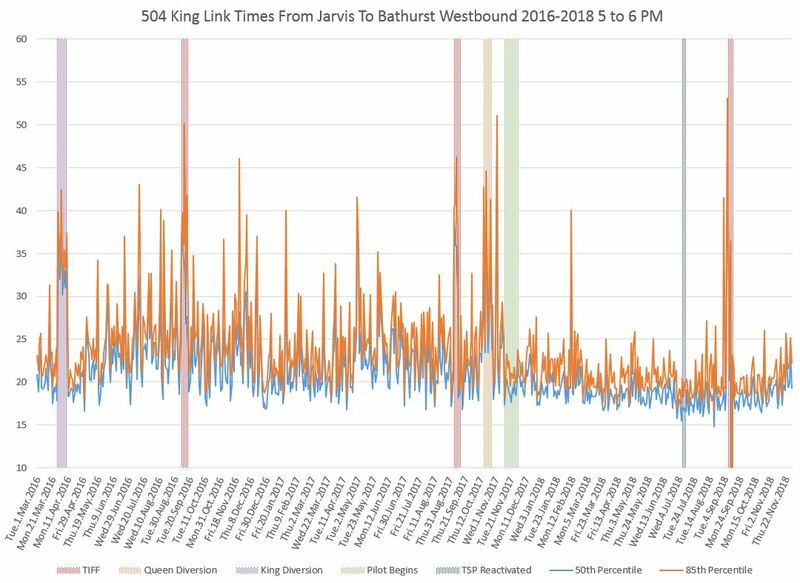 The following charts show the travel times between Jarvis and Bathurst (the pilot project limits) in each direction for the pm peak hour, 5-6 pm, over the past three years. The 50th percentile (median, blue) and 85th (orange) are shown. As with all previous charts, there is a small reduction in travel time compared to the pre-pilot data, but there is also a marked reduction in the range of values showing a much more consistent travel time. The values swing upward a bit in November, although they are still slightly better than a year ago when the pilot began. Some of this change is probably seasonal, but that will be verified with data from December and January. In the sets of charts showing the data for various times of day, this rise occurs mainly in the peak period. 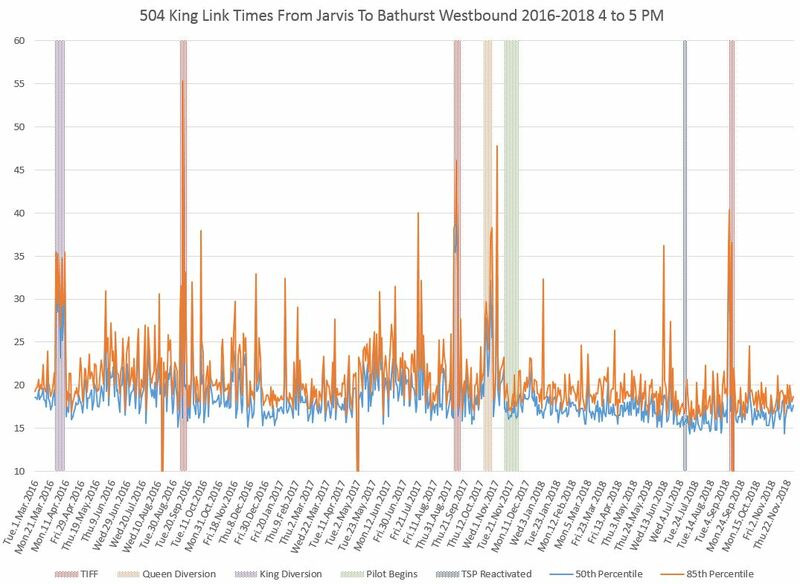 The rise in November travel times does not show up in the westbound data for the preceding hour, 4-5 pm. However, an increase is visible in the following hour, 6-7 pm. 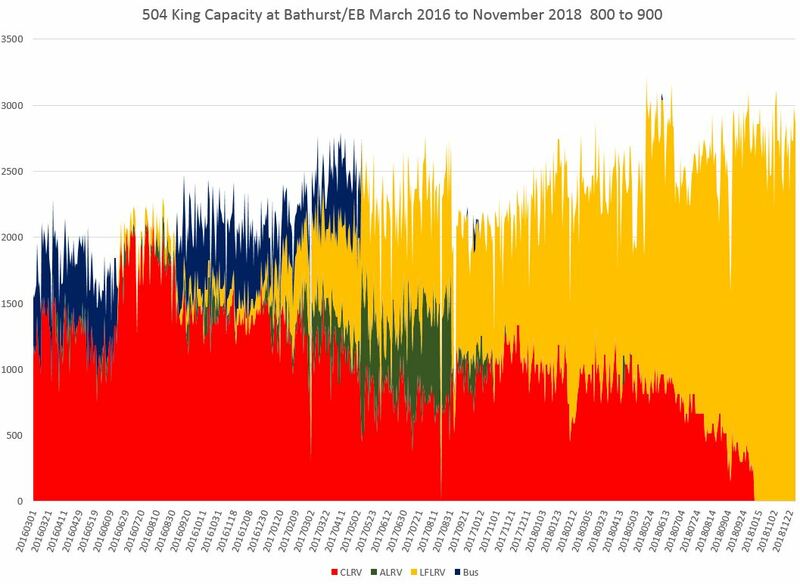 For a more thorough discussion of past events and trends in these charts, please refer to the October 2018 update. 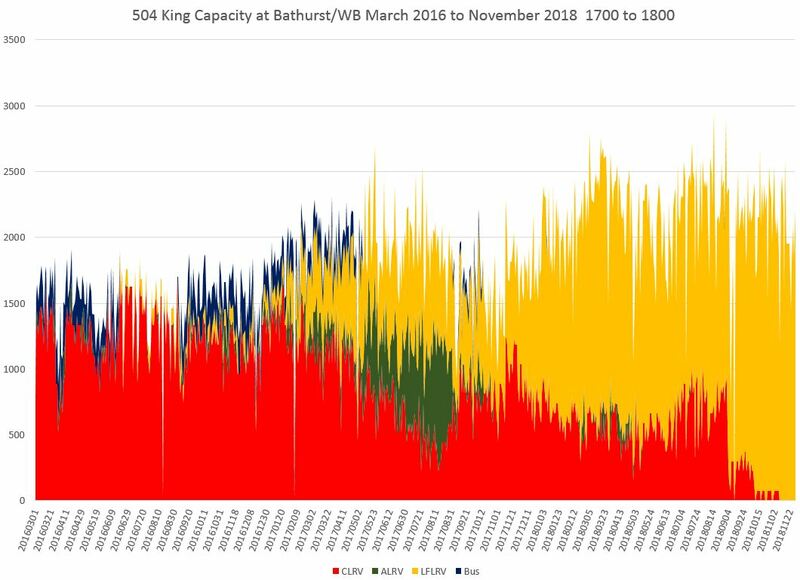 With 504 King fully converted to the larger, low-floor Flexitys, there was no change in scheduled capacity from late October (after the 504/514 consolidation) and November. As at Dundas West, the capacity leaving Broadview Station is lower than in the central part of the route west of Sumach where the 504A cars merge in from the Distillery. A small portion of the capacity at Yonge is provided by CLRVs operating on the 503 Kingston Road service. These cars only travel west to Spadina. They will disappear in January when the service reverts to bus operation via Wellington to York Street. 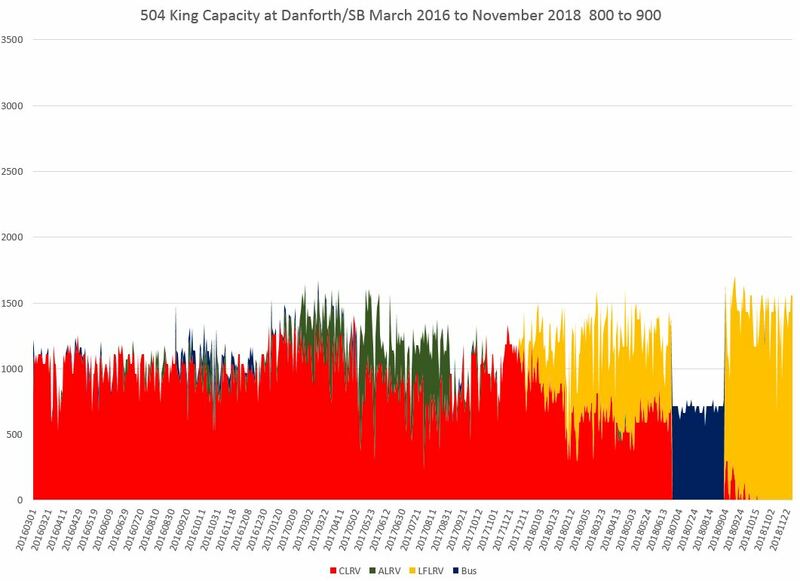 As in the AM peak, the capacity operated beyond Dufferin is reduced because only the 504A cars to Dundas West Station cover this portion of the route. The charts covering the four-hour periods 6-10 am and 3-7 pm for each location are linked below. As usual we have to thank you for your dedication to the details – another year of pulling out the obscure facts and figures and laying them out clearly. 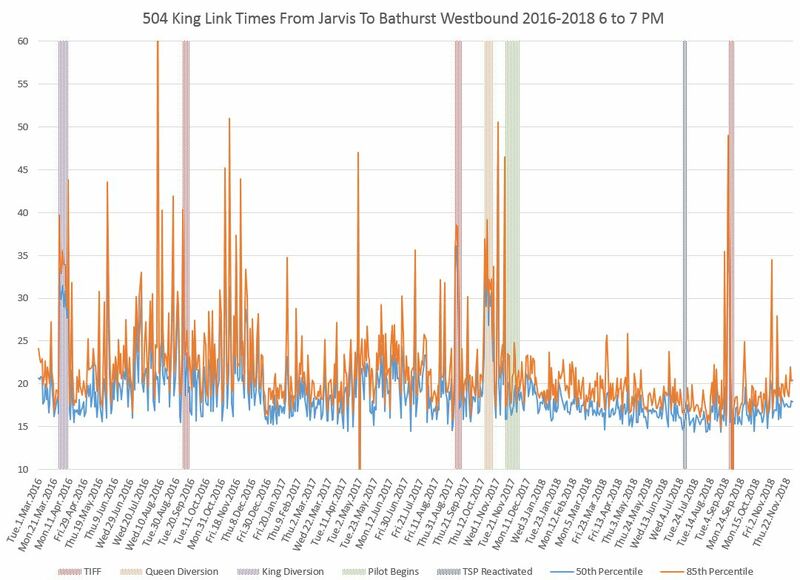 The data show that travel through the pilot corridor is more consistent (peaks and valleys are smaller) and the overall times are down. 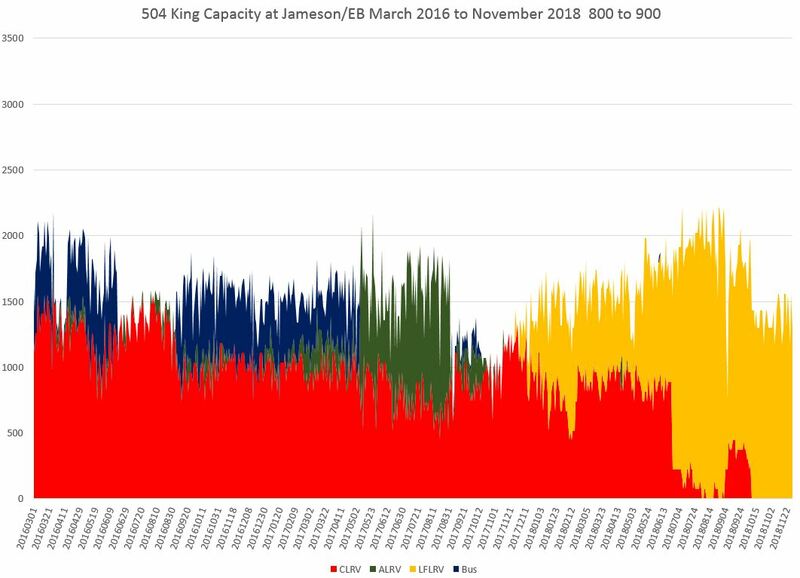 Capacity seems to be consistent, though a small taper in November 2028 (tied to the 504/A/B/5140 rejig?) seems evident. 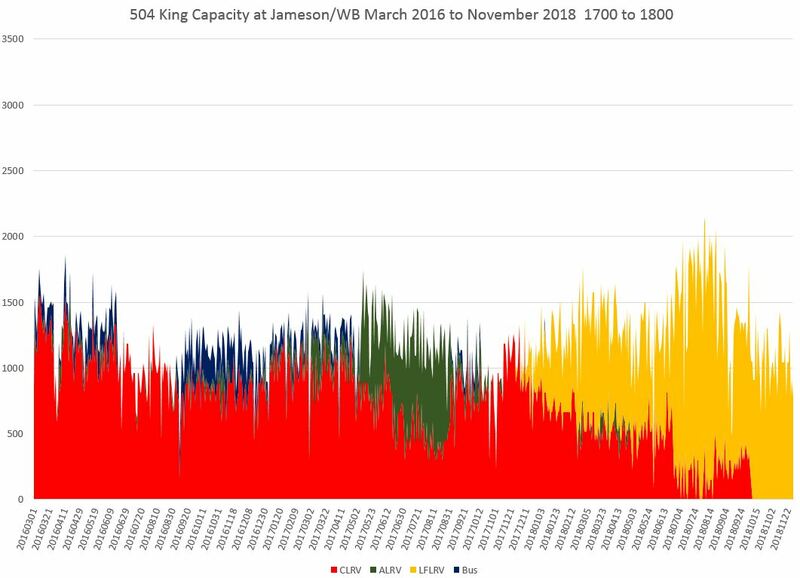 IMHO it seems that the King pilot is a success. The city has not helped with consistent traffic enforcement (I have seen drivers ignore the signage and drive through), or the TTC with changing routes and fleet. The city has extended the pilot and hopefully supportive data continues to accumulate. 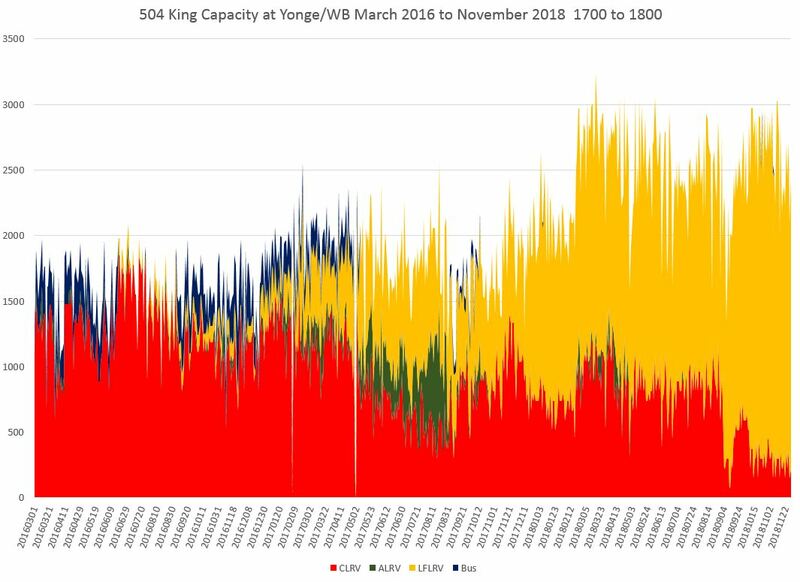 Steve: Yes, the slight drop in capacity is the result of the new schedules implemented mid-October. Another small drop will appear for the westbound-at-Yonge chart starting in 2019 because the 503 service to Spadina will no longer be present. The new route scheme is intended to provide more reliable service, although the lack of management of blending, or even of regular departures from the four terminals, has caused issues beyond the points where the routes split. Part II of this article, just published, looks at headway reliability in more detail.